The PowerShot SX150 IS has 14.1-million pixel CCD sensor backed by Canon’s DIGIC 4 optical Image Processor and comes along with a 12x optical zoom with 28mm wide-angle lens. It has 3-inch LCD screen, new Intelligent Image Stabilization(IS) system that automatically selects from seven different modes. PowerShot SX150 IS also features Face Detection, Advanced Subject Detection technology, Smart AUTO with 32 shooting scenes, High-Speed Burst mode, 720p HD video recording, aperture- and shutter-priority modes, a discrete-shooting mode. 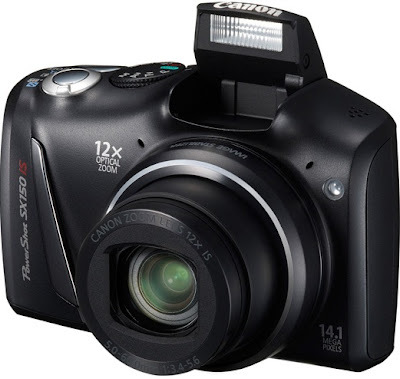 Canon PowerShot SX150 IS will be available in black and red at the beginning of September for $249.99. Tags:canon powershot, canon cameras, powershot cameras, canon powershot sx150 , powershot sx150 is, canon powershot sx150 is, canon powershot sx150 is features, canon powershot sx150 is specifications, canon powershot sx150 is review, canon powershot sx150 is details, canon powershot sx150 is availability, canon powershot sx150 is specs, canon powershot sx150 is images, canon powershot sx150 is pics, canon powershot sx150 is pictures, canon powershot sx150 is price, canon powershot sx150 is cam.